Though the villagers believe the beads are valuable, they refuse to sell them in hopes of using them as a crux for creating an eco-tourism attraction. 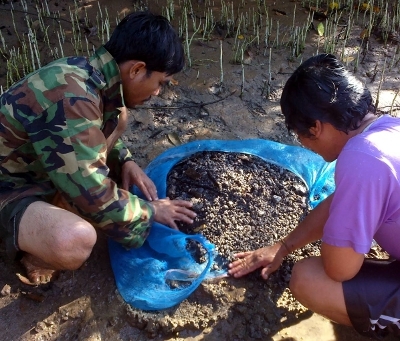 PHUKET: -- Local Krabi villagers, across the bay from Phuket, have ravaged an archaeological site in a mangrove forest in hopes of making it an eco-tourism attraction. 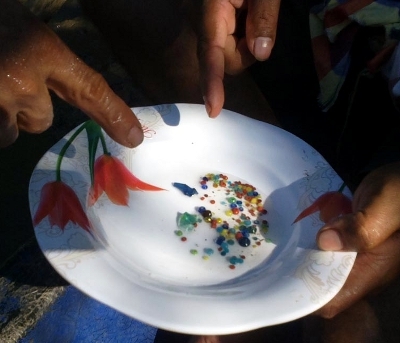 A variety of colorful beads were uncovered by local fishermen in Tambol Klong Thom Thai in Krabi about a month ago, said Teerapong Sithisak a 43-year-old resident of the area. After hearing the fishermen’s stories about the beads, other locals went to the klong and unearthed more beads, he explained. The villagers believe the beads are similar to “Klong Thom beads”, which were antique beads previously found behind Klong Thom temple about kilometer from the klong, he added. “Although we know the beads are valuable, we won’t sell them because we would like the area to be set up as an eco-tourism attraction,” Mr Teerapong said. “There have been many investors invading parts of Tambol Klong Thom Tai. We want the government to take action and preserve this mangrove forest area, because the forest is still healthy and the people in the area benefit from it,” he explained. No museum is currently prepared to take possession of the new find. All concerned are now waiting for officers from Fine Arts Department in Bangkok to inspect the beads and provide an assessment. Only in Thailand can the phrases "ravaged an archaeological site" and "eco-tourism" be used to describe the same event.